This classic Beach Cottage (the “Sandtrap”) built in 1956, with own private beach on Long Island Sound, is fully updated while maintaining its historical roots. Old Lyme Land Trust protected wetlands, with views of occupied osprey nests, great white herons and other native birds, adjoin the cottage’s private parking space. As part of Hawk’s Nest Beach community, you can walk to Garvin’s Store, where daily free activities for kids are organized, and play tennis or horseshoes on the courts. The large screened-in front porch, with chaise lounges, dining table and ocean views up and down the beach is a favorite location to enjoy your morning coffee. At high tide the front porch is less than 50' from the water. The kitchen is part of the “great room” with views directly on the water. A very large fireplace makes for cozy evenings when it is cool or for marshmallow toasting and when it’s hot the kitchen/dining/living area is fully air-conditioned. There is a master bedroom with a queen bed on the first floor (air-conditioned) and three bedrooms on the second floor, two with full size beds. The third bedroom has three twin beds. The upstairs bedrooms have ceiling fans and are open to the eaves (those requiring complete privacy should use the master bedroom). One and a half baths plus hot water enclosed outdoor shower to wash away the sea salt after a dip in the Sound. There is a washer/dryer in the cottage. Great local restaurants, renowned art galleries and museums featuring the historic Old Lyme school of American impressionism, both boutique and outlet shopping, spas, golf, antiquing, live theater, local farmers’ markets and much more are very nearby. Cottage owners, who live only 5 minutes away, provide a personalized guide, with maps, to the shoreline’s many attractions. Your hosts John Heckman and his wife Helen Cantrell live 5 minutes away in the historic village of Old Lyme. Long-time shoreline residents, they are immediately available to resolve any problems and answer your questions about the area. John is a former professor of comparative literature and current computer consultant; Helen is a painter and printmaker who shows her art throughout the Northeast. A number of her works are on the cottage walls. Our family has been coming to Hawks’ Nest Beach for over 100 years. John’s grandfather built this cottage in 1956; it has been our family beach cottage ever since, with generations of children and parents enjoying it every season. Decades of beloved beach reading and games await you, with a big tent on the beach and fluffy beach towels and chairs. Indoors you have air conditioning when it’s hot, and a wood-burning fireplace for coziness when it’s chilly. We have provided brochures on local attractions, as well as our own personal guide to the area including maps, arts, antiques, fine dining, sports and other features we think you will enjoy. Hawks’ Nest Beach is a real old-fashioned family beach community with traditions going back generations—children still walk up and down the beach road every weekend morning selling donuts out of an old red wagon; you can still see ospreys raising their young out of raised nests across the road; small inflatable boats and sailfish launch directly out from the beach into the Sound; and fisherman still go out on the ends of the jettys (and sometimes bring back fish!). Full downstairs bathroom. Half bathroom upstairs. Enclosed hot and cold outdoors shower. Old Lyme, charming New England village. Home of American Impressionism. Museums, Galleries, spa, restaurants. This classic Beach Cottage (the “Sandtrap”) built in 1956, with 50 feet of its own private beach frontage on Long Island Sound, is fully updated while maintaining its historical roots. 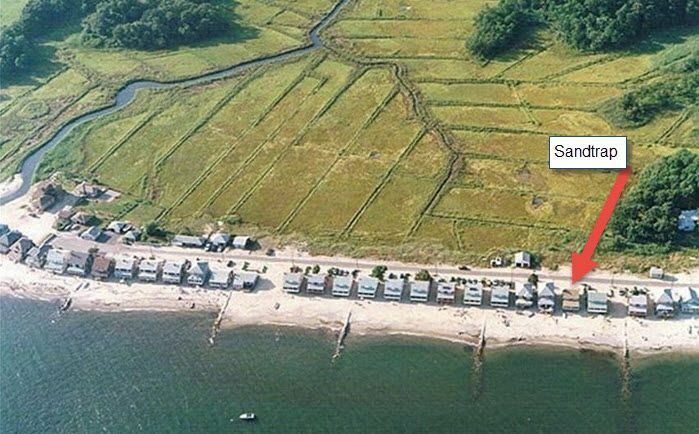 50 feet of private beach on Long Island Sound. Fully equipped with sufficient dishes for 10 people. Fully-equipped kitchen is part of great room facing water. Two dining areas: indoor and on porch. Each seats up to 10 people. Several hundred books. Great beach reading. Several dozen board games and jigsaw puzzles. Sand toys for young kids. 10x10 beach tent. Beach chairs. Great cottage!! Wonderful that most everything is included. John the owner is fantastic to deal with!! I can't wait to come back next year!! Thanks for the kind words. We look forward to having you back next year. The house is perfect for the CT shore. Simple, rustic with TONS of books, games, beach toys. Totally furnished with linen and towels and they did the small stuff like supplying hand soap in the bathrooms. Kitchen stuff was adequate but I probably would bring more stuff next year to supplement. NO TV - just the simple pleasures of life and friends to enjoy the ocean and tranquility. WiFi was good. The owner is very informative and helpful. He supplied a book of information about the house, the area and sundries. We never have had an owner go to such lengths to help their renters. We loved it. We are delighted that we discovered such a comfortable gem. Had a great time! Being in a house on the water was even better than I had expected. Neighborhood was very kid and dog friendly! This is the second year that we have rented the home for a 3-generation family vacation. The home is clean and comfortable. The host is friendly and accommodating. We find it homey and our vacation was relaxing. We even had our week's groceries delivered the day we arrived so we could spend the maximum time in the sand and enjoying the views. We enjoy the proximity to the water and the beach is clean; we spent most of our waking hours out there. My 3-year-old niece can play safely under the tent and in the water (with an adult) - it's one of her favorite places and both last year and this year she talks about it long after the vacation is over. My mom suffers from dementia and normally a new place makes her anxious but after a day even she was relaxed - playing in the sand, doing puzzles, and regularly telling us how much she loved being there. We have loved all the memories we've made in this home and on this beach. It was great having you. Hopefully this can become a tradition for your family as it has been for ours. Cozy and rustic cottage just steps from the ocean...stunning view! The cottage was cozy and quaint and equipped with everything you need for your beach vacation. Just steps from the water and the views and sounds of the ocean were breathtaking. We had four young children with us and there was always something for them to do in the Hawks Nest community. John, the owner was very responsive and accommodating. It was definitely an unforgettable week! This cottage was perfect for our vacation with three generations of the family. From my 70-something parents to my 2-year-old niece we all loved the cottage and especially the beach! The cottage was clean and well-equipped with everything we needed from beach toys to kitchen needs. John was so easy to work with. He answered all my questions, sent out a booklet with information and suggestions before we got there and fit us into his schedule both checking in and out without an issue. To access the home, there is a short flight of stairs - I have some mobility issues but was fine climbing them with the help of the railing. On the first floor is the kitchen/living area, a full bathroom with a tub/shower, and a bedroom. There is also a screened in sun porch with a lovely table where we ate all our meals and some lounge chairs where more than one nap was taken. The porch faces the beach/ocean and is a beautiful view. Upstairs is a smaller bathroom and three bedrooms. We all were comfortable in the beds. To access the beach, you leave by the backdoor and walk down a few steps and you're basically on the beach. There is a sun tent that is put up for you and you can sit under there or in the sun - whichever you'd like. The water was fairly calm and there were swimmers, people on paddle boards, and such all the time. The beach was NOT crowded at all - everyone stayed in the water in front of their home it seemed. My niece loved being at "Nanna's Beach" each day and playing in the water and sand. The community is nice - everyone drives slowly so you don't need to worry about kids, it's clean and quiet even with all the people who are there. There are kids who bring by donuts each morning - what a nice way to wake up! And, the ice cream man visits a couple times a day too. By our fourth day my mom was already asking if we could come back next summer. I certainly hope so. Thanks for all the kind words. It was a pleasure having you. The Sandtrap is certainly the perfect babysitter for young kids!! Rentals are Saturday to Saturday: Arrival time 4 pm Saturday; departure 11 am following Saturday. I will meet you at the cottage to provide keys and show you the cottage, and at checkout to get keys and make sure everything is ok. If so, deposit will be returned at checkout. Down payment will be refunded up to 30 days prior to beginning of rental period less 2.5% credit card fee.